Here's a super easy, quick and yummy meal I whipped up last night! I have seen this recipe on This Week for Dinner multiple times and I was very excited to try it! After a weekend of eating out (even though all of our meals were delicious) I was really craving a home cooked meal. This one really hit the spot! Here is the link to her recipe...I made mine exactly like hers, so no need to rehash the recipe. And if you haven't checked out Jane's site you are missing out! She has many delicious recipes but more importantly, her meal plans are fantastic. I've talked about her site here. 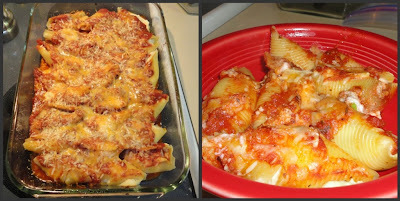 I love stuffed shells. These look amazing! Cute blog and yummy food!